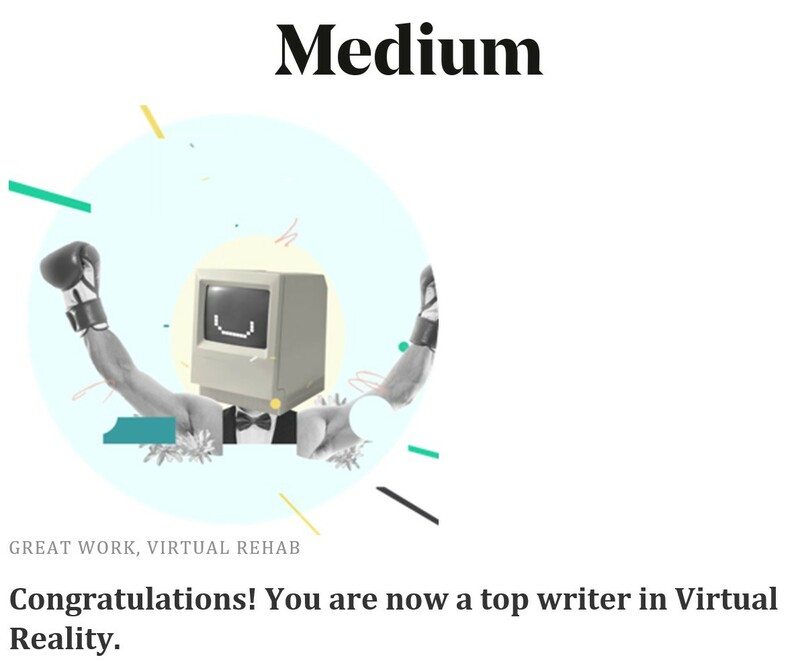 Although this is only our ninth article, Medium has already graciously recognized our efforts and put us in the category of “Top Writer” for Virtual Reality. Now how about that for an achievement? Thank you Medium for your support. We very much appreciate it. Now, let’s get back to business ! Ladies and gentlemen, today, we are going to tell you more about our Virtual Rehab Business Model. Yes ! That’s correct ! So, how are we making money now and what are we planning to do in the near future to take our business to a whole new level? They say “pictures speak louder than words” … So, have a look at the below, and we will explain what it is all about afterwards. Well, that wasn’t a picture, per se, but you know what we meant. Let’s now delve a bit more into what these boxes actually mean in a bit more detail. Virtual Rehab’s current business focuses on Business-to-Business (B2B) customers. Therefore, our typical customers include Rehab Centers, Hospitals, Correctional Departments, and so forth. These folks then use our service offering with their own users/patients accordingly. License Fee: This can also be referred to as a Platform Fee. The license fee is a fee that we charge for the use of our Virtual Rehab platform (VR and/or AI). This is something that our customers incur on a monthly or an annual basis. Subscription-Based Fee: This is the fee that we charge our customers for the use of our programs. We typically assess the size of the organization or the facility we are dealing with along with the number of users/patients who will be using our programs and allocate a charge to the service offering. This is also charged on a monthly or an annual basis. Development & Support: These are the fees that we charge for developing customized programming tailored to the needs of our clients. These fees are one-time charges. In addition, we add on top of that the price that our customers would incur for receiving our top-notch 24x7x365 (or 366 for a leap year) support along with any remote training required throughout the year. So, nothing complex here. We like to keep it simple and we like to keep everything transparent to our customers, which is another reason why we offer a line-item pricing in every proposal that we send to our customers. Moreover, we make zero percent margin on all third-party hardware and we typically charge a very nominal fee for set-up and for installation to get our customers up-and-running. Now, we move on to Virtual Rehab on steroids ! (Well … what we mean is … the next phase of Virtual Rehab Service Offering to our Business-to-Consumer (B2C) clients — or as we all referring to them — end-users (you and us)). So, let’s get back to the box on the right-hand side of the figure above and delve more into it in more detail. $VRH Token: Users will be able to leverage the $VRH token to make payments directly through our Virtual Rehab Online Portal for any services that they wish to purchase from us. For instance, $VRH tokens will be used to order and to download programs straight from the Virtual Rehab Online Portal. These programs can then be executed by the user at the comfort of the user’s home or wherever the user is located. Moreover, let’s say the user wants further analysis of the results the executed programs, using our unique expert system (which leverages Artificial Intelligence — AI), they will then be able to make purchases of this extra analysis through our Virtual Rehab Online Portal. As you all know, we also have a third use case for our $VRH token, which is an incentive to users for going out there and seeking help and counseling, which is what we call, “Proof of Therapy”. In other words, if a user proves to us that they have gone ahead and sought help, counseling, or therapy in general, we will reward them with $VRH tokens, which they can then use to trade on exchanges and get $$ or they can keep to order more services from the Virtual Rehab Online Platform. We are extremely proud of this use case and we are positive that it will make a difference in many of the vulnerable populations’ lives out there. Yes. Yes. We know what you are thinking. You are probably saying that the users might go to seek help, counseling, and therapy just for the money. Right? Well, yes. That is a possibility. However, just like anything in life, we are sometimes forced to do things that we do not like at first, but then things actually do change. That’s exactly the situation that we could be facing here. Although the user may start doing all of this just for the money, but imagine what positive impact seeing a counselor or a therapist every now and then will have on the user. We want them to get used to seeking help and counseling. Eventually, users will start going on their own because they do see the benefit of doing it. We all have heard many stories of such. The other point we want to make and you might be wondering about is whether we will only be launching with $VRH tokens as a way of payment for our services? Well, at launch, we will offer both Fiat and $VRH tokens. However, there is a caveat here. Should the user decide to pay using Fiat, it will be a more expensive option versus paying with $VRH tokens. In other words, for example, if a program is priced at $100 in Fiat, it will be priced at 800 $VRH ($80). So, $VRH will always be the cheaper option, which we strongly believe that it will allow for further adoption of our $VRH token. As we move forward, and $VRH becomes better adopted among our users, the Fiat option will no longer be made available. OK. Now, on to the second element. Virtual Rehab Therapy Center: This is something that we plan to introduce by Q4 of 2019. We are extremely excited about this as it will be the very first therapy center worldwide that will combine both traditional therapy (with therapists and with psychologists) along with the use of the latest and the greatest technology — Virtual Reality, Artificial Intelligence, and the Blockchain. Combining the best of both worlds will have great results, which is what we have already proven, where we demonstrated that 87% of participating patients have shown an overall improvement across various metrics within the following categories — Problem Recognition & Acceptance, Openness to Change, Locus of Control, Decision-Making Influences, Emotional Intelligence & Regulation, and Motivation & Resilience. Moreover, the article below, in which the FDA allows the use of a mobile medical application for substance use disorder further demonstrates that the data has shown a statistically significant increase in adherence to abstinence for the patients with alcohol, cocaine, marijuana and stimulant Substance Use Disorder (SUD) in those who used an app, 40.3%, compared to the patients who did not (in other words, those who only stuck with traditional therapy), 17.6%. And guess what? We’re only talking about an app here — not Virtual Reality and Artificial Intelligence, where users are completely immersed into their surrounding environment and we further use Artificial Intelligence to further make sense and make future predictions based on all data and all biometrics gathered throughout the user’s experience. This further affirms the results we have attained thus far and communicated earlier in this article. OK. Let’s go back to the business model. Sorry. We sidetracked for a bit. So, for the Virtual Rehab Therapy Center, users will be charged on a per visit basis or we will have the option for a weekly, a monthly, or an annual membership. Ladies and gentlemen, that’s all we have for you today. Hopefully, it all made sense to you. In case you have any more questions, then please do not hesitate to contact us. Drop in at our Telegram channel. We have over 20k members, so we would love to have more. Oh, one more thing ! Our Private Sale is now OPEN ! So, if you are interested in supporting us (and we hope you do), then please drop us a line at investors@virtualrehab.co and we would be happy to tell you more.